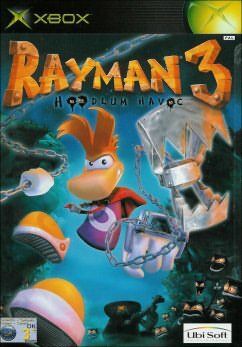 The world's favourite limbless hero is back and on the small screen in Rayman 3: Hoodlum Havoc! It's been a little while since the last time that Rayman was seen in a game and that was on the PS2. With the other two consoles making their way into the field, this great little game has spawned it's way across all three so everyone can enjoy it. 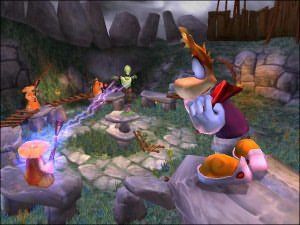 This Rayman departs from where the others safely lived, jumping off the deep end with a story that quite frankly was not coherent in some part and stocked with some fairly nightmarish creatures thrown in for good measure. There are good Lums and bad Lums in the world. 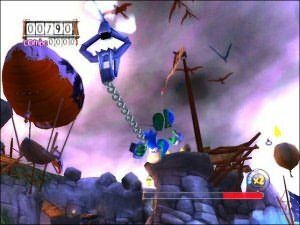 Good Lums are a source of energy for Rayman and are red in colour. Bad Lums are well.. bad and are black in colour. The baddest Lum of them all named Andy is going to destroy the world from the inside out by absorbing the energy at the heart of it in an attempt to propagate himself. The title is a funny one with the story only vaguely related to the junior audience that Rayman used to be targeted at. There is a lot of innuendo that I am sure that the younger market won't get thank goodness and the game definitely has a lot more attitude. On Xbox this game looks sweet and is genuinely lovely to watch and play. Of course being a platformer there are a lot of things to do like jump and run and oh there's some more jumping and running. I should be fair though and let you know that the game does up the ante in terms of cool in that Rayman can find and use different "costumes in a can" that will increase his abilities in different ways depending on the can. These cans wear out however you don't have to hunt around for them and the right can is usually at hand for a particular task. Combat is similarly simplistic with easy button tapping to shoot his gloves off and punch enemies. You can lock onto foes though this is a tad frustrating as if they move, the camera does not adjust to compensate for it. There are a number of combos shots that you can undertake however they are fairly primitive. The true focus of the title is on the jumping and collecting and this is where the game really shines. The design of the levels makes for some very interesting viewing as well. The worlds are truly fantastic and the ways that they are presented will have you standing still in amazement, just looking around at the scenery. 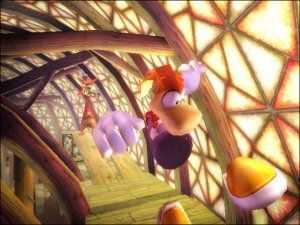 The quality of the title doesn't stop merely on a visual level however with many great animations and character designs to further populate and challenge Rayman in his world. The creatures look like the designs of a crazy mind and to date, I've had nothing to convince me otherwise. Quite simply it all looks and moves wonderfully! Finally the sound on the game is in Dolby Digital 5.1 and takes advantage of that setup in it's entirety. Going from a surround setup to just a normal set of speakers will almost be devastating if you are aware of what you are missing out on. Music is totally suitable for each and every part of the game and was just as important an element to the whole experience as any other part of the title. I'd have to say that currently I have enjoyed Rayman more than any other platformer on the XBox. If you are even vaguely interested, this game is certainly worth the purchase and I have no hesitation in recommending it.